Carved oak, imitation leather upholstery. This armchair is from a set of dining chairs designed by A.W.N. Pugin for Charles Scarisbrick of Scarisbrick Hall, Lancashire in about 1838. Pugin made alterations and additions to Scarisbrick Hall, a sixteenth-century manor house, between 1836 and 1845. It was his first independent architectural commission. The design of the chair is very similar to one illustrated by Pugin in Gothic Furniture in the Style of the 15th Century, published in 1835. Although the design is based on medieval prototypes found in manuscripts these earlier examples would not have been upholstered. Despite this, the relatively simple style of the chair marks Pugin’s move away from the decorative and fanciful Gothic of the Regency period, towards a correct and more honest use of sources. The V&A also owns a dining chair (Circ.237-1951) from the Scarisbrick set. Carved oak X frame armchair, with the seat, back and arms upholstered in imitation leather. One of a set of dining chairs and armchairs designed by A.W.N. Pugin for Charles Scarisbrick of Scarisbrick Hall, Lancashire in about 1838. Pugin worked for Charles Scarisbrick between 1836 and 1845, making major alterations and additions to Scarisbrick Hall, the sixteenth century manor house which had already been extensively altered by Thomas Rickman between 1813 and 1816. Edward Hull, a furniture dealer of 55 St. Martin's Lane and 109 Wardour Street, London, supplied furniture for Scarisbrick but the surviving accounts are not sufficiently detailed to identify these dining chairs. Two armchairs and six chairs were sold by Sir Everard Scarisbrick at Philips Son and Neale, London, 13th August 1951 lot 59. This armchair and one chair were purchased by the Museum. The rest of the set was bought by the Ministry of Works, possibly for use in the Houses of Parliament. 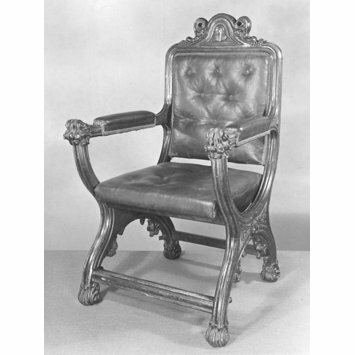 Historical significance: One of a series of chairs made for Scarisbrick Hall in Lancashire, Pugin's first important architectural commission. 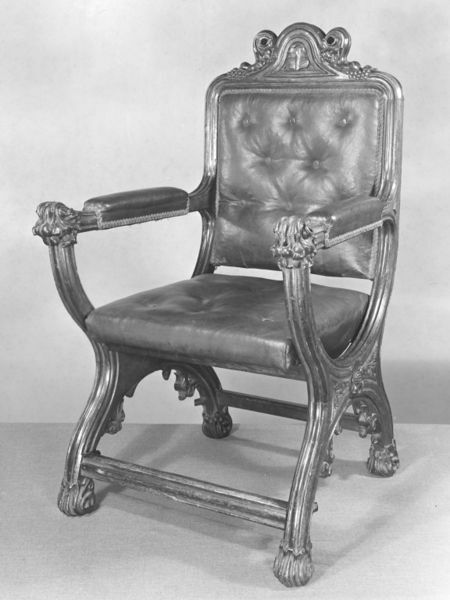 This chair is a variation of a design published by Pugin in Gothic Furniture in the Style of the 15th Century (1835). It was based upon medieval examples illustrated in manuscripts. As such, it represents Pugin's move away from the decorative and fanciful Gothic of the Regency period towards a correct and more honest use of sources. The manufacturer is not known. The Wardour Street antique dealer John Coleman Issacs had furniture of this type made there from designs in Pugin's book and imported into England via Hamburg. Pugin was closely involved at this time with the London antique trade, buying and selling through the dealer Edward Hull, whose premises were also in Wardour Street. In 1834 Pugin designed a range of furniture for Hull, and at Pugin's suggestion Charles Scarisbrick patronized these dealers through the late 1830s and into the 1840s. Carved oak X frame armchair, with imitation leather upholstery. English, 1837-1840. Designed by A.W.N. Pugin for Scarisbrick Hall. Atterbury, Paul, et al., A.W.N. Pugin: Master of Gothic Revival, New Haven: The Bard Graduate Center for the Decorative Arts, Yale University Press, 1995.